Time to catch up. . . I cannot believe it has been so long since I have updated this blog! A lot has happened in the past year. It has been a year of healing and strengthening, one of praying and growing. My surgery for the nerve tumor inside the base of my brain went very well, but it really knocked me down. One day I was riding my exercise bike for eight miles and three days later it was a struggle to make it from the couch to the bathroom. The trip up the stairs to our bedroom was slow with several stops for rest. It was six weeks before I could make it to church, both because it was a long walk and because I couldn't sit up for an hour. It took a long time to be strong enough to enjoy a trip in the car, much less go out to dinner. I did lots of physical therapy to regain my balance and to overcome dizziness. Unfortunately, I developed pneumonia during the healing process and it returned three times over the fall and winter. hopefully I have conquered that problem. I thank friends and family who live close for the meals they sent and for coming to visit. I thank Ron for all the dinners he fixed, dishes and clothes he washed and errands he ran. I don't know how we could have made it without his total effort. At the three month mark in my recovery we took a short cruise to New England and Canada with our dear friends, Donna and Rich Garlick. By then I could walk for one to two miles, but standing still for more than about 10 minutes was a difficult. Fortunately, our tours were mainly driving, but there was enough walking and standing to challenge me! The tumor was on my vagal nerve. Although they did not have to sever the nerve, it received some trauma in the surgery. I underwent several months of physical therapy to help me with balance issues. I also needed to regain strength. I found I could walk for fairly long distances, but standing tired me quickly. In fact, that is still an issue. 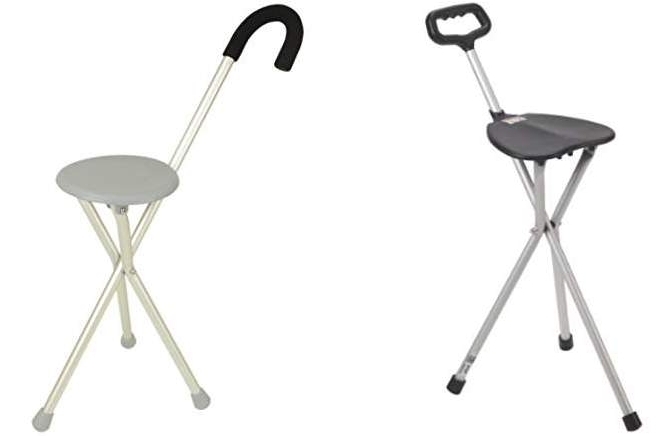 Over the years I had seen a number of stool canes. Although they look handy, I had seen several people take a tumble as they were sitting down. There had to be something better. My favorite place for shopping for unusual items is Amazon, and once again I found something that looked like a better idea. It is pretty stable. I do make sure it is sitting firmly, and I did almost land on the ground one time, but since that one incident, it has served me well. It is light, easily foldable, and easy to carry. in fact, you can see Ron carrying it for me in Quebec last fall. None of us like to admit that we are aging, but I would rather carry my stool than sit at home and miss the grandchildren's sporting events, shopping trips on busy days or opportunities to explore the world.